Revel provides the ability to add variations to menu items without having to create a new item each time you want to modify a single item. For example, if you're selling a sandwich, you may want to give customers the option to customize sandwich toppings. These options are called Modifiers. 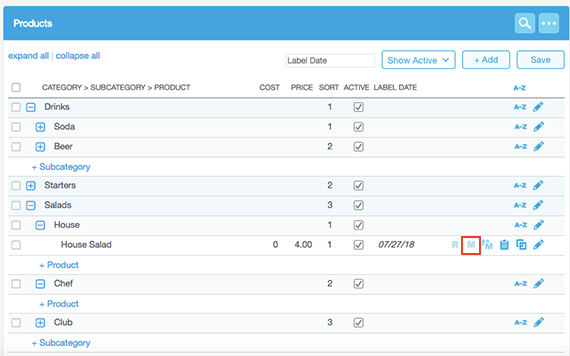 Modifiers allow you to customize orders and provide options for your customers with just a click of a button on the Point of Sale. To create additional modifiers, follow the steps above as many times as you need to create the modifiers for your products. When you've created all your modifiers, click Save. Note: Don't forget to refresh your POS stations for your modifiers to appear. 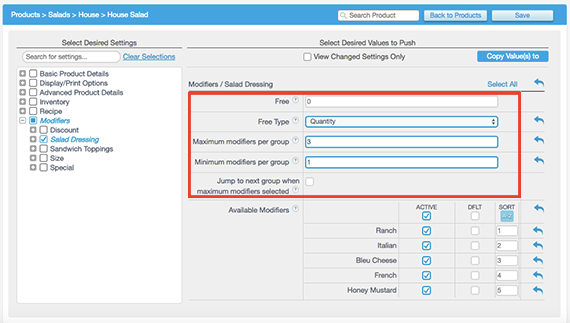 Before you associate a modifier to a product, it's important to understand the options you have available to either create free modifiers (like salad dressings included with salads), or charged modifiers (like pizza toppings), where the customer will pay an additional amount per modifier. Let's take a look at these options! Free Type: For some businesses, some modifiers (usually toppings) are sold at an additional price of, say, $0.50 or $1.00. However, oftentimes there are a certain number of toppings that clients that choose from that come free with the product (e.g. first three toppings are free, additional toppings are $0.50). In order to set these free quantities, the parameters for these free amounts have to be set during modifier association. Quantity type: This is the maximum number of modifiers within that class that you would like your customers to be able to order. Price type: This is the maximum dollar amount that you want discounted from the total of all modifiers chosen. In the example above, the customer will be given the first three modifiers/toppings for free, and all other toppings will be charged at the price listed for that particular modifier. If the Type had been set to Price, then up to $3 worth of modifiers would be given for free. Minimum: Customers have to choose at least a certain number of modifiers. Example: at least one flavor for a smoothie beverage. Maximum: Customers can choose at most a certain number of modifiers. Example: at most six kinds of donuts for a half-dozen. Any more modifiers chosen past the sixth donut is not allowed. Min & Max: Customers have to choose at least a certain number, but no more than a higher or equal number. Example: Choosing at least and at most one temperature for meat (e.g. medium). Now that you have created your Modifiers and learned about the options you have for offering them free or for an additional charge, the next step is associating these Modifiers to individual Products. On the right side of the item name, click the M for Modifiers. Default: If you would like a modifier to accompany the product by default, click the DFLT box in line with that modifier. Free: This signifies the number of free modifiers for this modifier class. Free Type: This is the number of free modifiers for this modifier class. 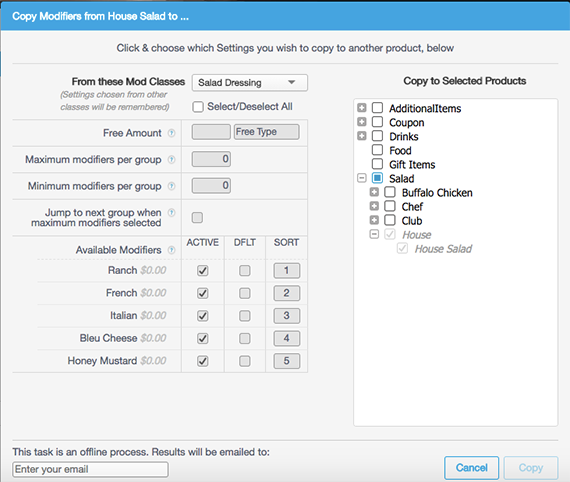 Maximum Modifiers per Group: Customers can choose at most a certain number of modifiers. Example: at most six kinds of donuts for a half-dozen. Minimum Modifiers per Group: Customers have to choose at least a certain number of modifiers. Example: at least one flavor for a smoothie beverage. 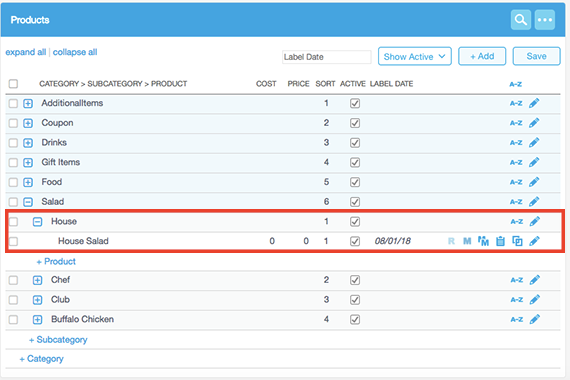 Jump to next group when maximum modifiers selected: After the maximum amount of modifiers have been selected, this feature will automatically add the item to your order screen. 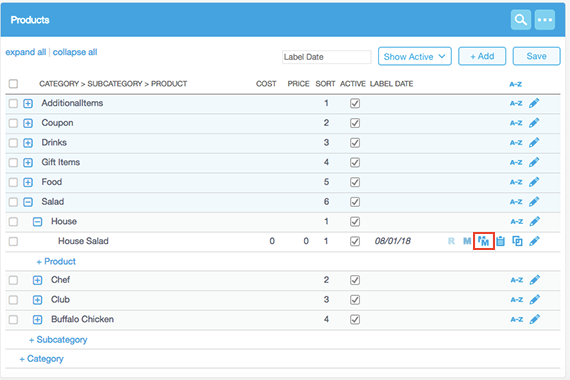 Once you've linked all the Modifiers to Products that you'd like, click the Save button and refresh your POS stations. 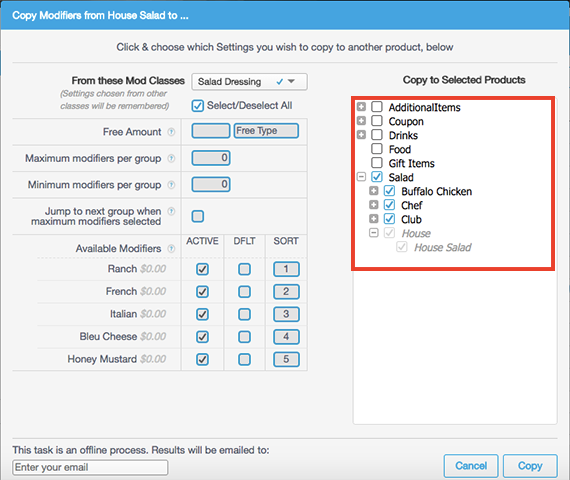 You can save time by copying certain modifiers to multiple products - so if you have say, five different salads and the dressings are all the same, you don't have to assign them to each individual salad, you can just copy them from one product you're attaching to. Let's see how!.